Finally, computer support designed for small and home-based business. So we provide the same level of support as large corporate IT staffs offer to the corporate employees. Therefore with Saunders Business Solutions, you pay one low very affordable price per month for everything or we can provide the tools for you to handle it yourself. You choose the level of backup you need for your system. Then we will install, configure and monitor it for you. PC Magazine's Editor's Choice Award - 3 years straight and you don't even have to install or configure it. We handle it all for you. We have four very affordable levels of computer security/support. Therefore all of our programs are designed to make your life easier. Some of you would prefer to Do-It-Yourself. Great, we have that also including Domains, Email, Website Hosting and much more. Here is what our customers are saying. "Always there when I need them … that's Rob Saunders. His knowledge gives me the confidence to do things in the IT area, where I have little knowledge. Dependable." "Working in the finance industry we have the utmost concern for our security and backup of data. 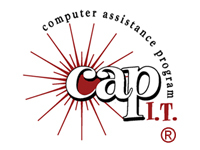 I am 100% confident and satisfied having CAP-IT secure our company’s data and backup for all of our computers. It gives me a great peace of mind and the service is always excellent. Thanks Saunders!!!!" 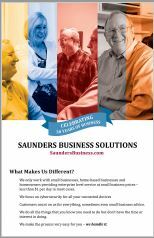 "We have been doing business with Saunders Business Solutions for a long time. Very trust worthy and a fun company to work with. Trust them completely to do the right thing and they have never let us down. Good ideas and a strong focus on always trying to upgrade and make our company better. Would recommend them to anyone." Your first decision is, do you want it all handled for you or do you want to Do-It-Yourself? Then click the menu option at the top of this page. Most of all, we at Saunders Business Solutions will do everything possible to make computing EASY.